Are you looking for a real southern meal with fried chicken? If you're tired of the same old fried chicken you ate the last time you cooked, well it's time to spice things up a bit and try something differ. You should cook up this smothered chicken recipe for a nostalgic taste of the southern past. 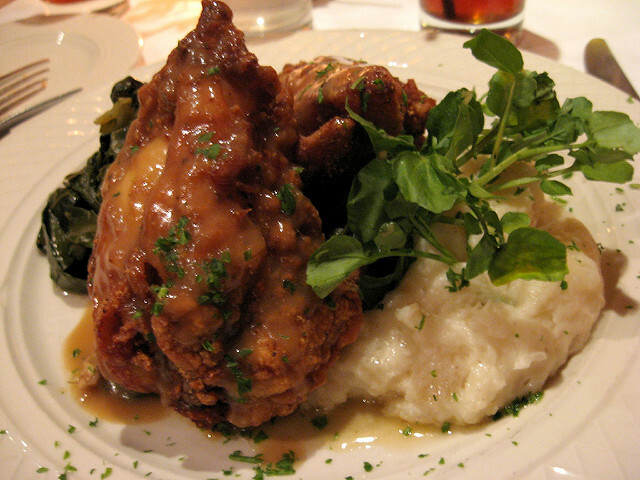 Nowadays, because of fast foods, finding smothered chicken in your favorite restaurant is nearly impossible. It seems that most people are only interested in quickly prepared meals. No worries though, if you are looking for some real, authentic home cooking...you need to try out smothered chicken. Just the other day I had a strong craving for some smothered chicken. I was forced to the kitchen into action, since there are no restaurants where I live that serve the dish. To tell you the truth I'm sure my own cooking tastes much better than many of the restaurants in my area. All said, after eating the meal of smothered chicken I prepared, I can honestly say I was very satisfied and please with the results. Enough about me. Are you ready to try out this recipe? The recipe for smothered chicken that follows requires some prepare work and cook time, but you'll thoroughly enjoy this chicken dinner. Clean chicken by rinsing under cold running water. Pat chicken pieces dry with paper towels. Season your chicken by lightly sprinkling each piece with salt and pepper. Set aside. In a large deep skillet heat vegetable oil over low heat until hot, about 4 to 5 minutes. Place chicken in hot vegetable oil and over medium low heat, fry chicken until golden brown turning frequently. Remove chicken from skillet. Next add vegetables consisting of garlic, yellow and green onions to skillet, cook and stir until thoroughly browned. Remove skillet from heat. In a medium bowl, combine flour, soy sauce and chicken broth. Using a wire whisk stir until flour mixture is smooth. Return skillet with vegetables to stove and add flour mixture. Over medium heat, cook and stir with wire whisk until gravy begins to boil and thicken. If necessary add more broth if gravy is too thick. Return browned chicken to skillet, reduce heat to low, cover skillet with lid and simmer for 35-40 minutes, stirring gravy and turning chicken until done. As a serving suggestion, serve your smothered chicken over a bed of white rice with vegetable medley and corn bread.